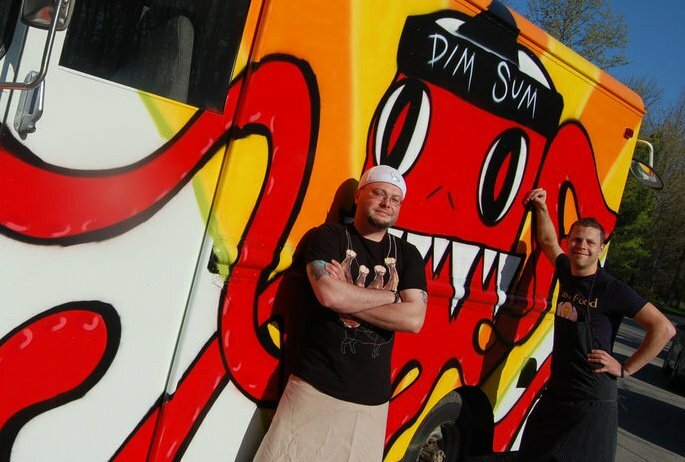 Dim and Den Sum: Two Men and a Food Truck! Imagine for a moment the answer to one of life’s more difficult situations; you don’t want to eat at home, and you don’t want to go out to dinner at a restaurant. What are you left with? How about the restaurant comes to you? Now we are talking! Mobile food carts, which have been popular in Boston, New York, Chicago and San Francisco, are making their way slowly to Cleveland. Now although the first thought when hearing food cart is that of a hot dog stand, food carts really have come a long way. In fact, you’d be impressed by the level of gourmet cuisine that you can find in these portable kitchens. Cleveland now has its first official food truck under the new city regulations. The chef owners are no strangers to Cleveland, or to great food done well. Chefs Chris Hodgson and Jeremy Esterly now own and operate Dim and Den Sum. As you might guess, Asian influences pervade the menu with inventive Dim Sum selections. The food is reflective of cuisines from Japan and Korea, combined with the southern comfort food approach – comfort food with an Asian twist. Also, no menu item is more than $6. This is a great deal considering the quality of ingredients and creativity of the food. Chris and Jeremy worked together previously at Fire Food and Drink at Shaker Square, and knew from their first encounter that they would eventually open a business together. Trust me; these chefs are very talented, inventive, and enthusiastic to bring mobile cuisine to Cleveland. They will also focus on locally sourced food ingredients. From the picture above of their truck, you can’t help but conjure up childhood memories of the ice cream truck driving through your neighborhood, with children trailing behind hoping to get their hands on a Rocket Popsicle or Fudgesicle. Look at this as the adult version of the same magical experience, and I expect you’ll see many people chasing this truck hoping to get their hands on a Dim Burger or a Kimchi dog! Be sure to follow Dim and Den Sum on Facebook (facebook.com/dimndensum) and Twitter (http://twitter.com/dimanddensum) to see where they are and their next stops…you don’t want to miss out. Their website is http://www.dimanddensum.com and they expect to officially launch the truck into action May 10, 2010. Monsieur Anton says: I think that mobile food carts are a great addition to the Cleveland culinary scene, at what better use of the carts than Dim Sum? It is reminiscent of the carts that are pushed through the eateries in Chinatown bringing along little bite sized bits of goodness. I think that this translates well to the food cart. I am also happy to see that the first food cart to hit the streets under this new endeavor for the city is something of culinary worth, and not some run of the mill “roach coach.” Well done Chefs Hodgson and Esterly. And start me out with some shrimp shumai and steamed buns! I’m very excited for the food truck movement to come to Cleveland and can’t wait to try Dim & Den Sum. One note on your article though, food trucks are not currently allowed in Chicago as you mentioned. Thanks Dave for reading up on us…I believe Chicago does permit variations of food carts that, either through grandfather clauses or other loopholes, are allowed to operate. I look forward to chasing down some Dim and Den Sum as well…now if we could just get a mobile liquor store to follow behind them for the complete meal experience!! Thanks again for tuning in! Chef Gusteau. I wish they’d implement this in Ireland. Damn good idea! !